The Fleece Inn (National Trust) Public HouseEnjoy traditional English cooking and a wide selection of real ales and traditional ciders whilst soaking up the historical atmosphere of the Fleece Inn. Surrounded by the Cotswolds, the Fleece Inn nestles in the centre of the village of Bretforton. Originally built as a long house in the time of Chaucer by a farmer named Byrd, the Fleece remained in the ownership of the same family for the whole time until 1977 when Lola Taplin, a direct descendant of the man who built it, bequeathed the Inn to The National Trust. After a devastating fire in 2004 the Fleece was restored to its former glory and continues to take great pride in its traditional English roots. Home to one of England's oldest pewter collections and many more historical features and stories the Fleece houses countless memories, old and new. During the summer months, the Inn is a hive of activity, being an ever more popular Wedding venue, our thatched barn is the perfect place for receptions, parties and corporate events. During the colder months, the roaring open fires create a cosy place to enjoy a meal with friends or even a spontaneous glass of mulled wine. With a strong Folk following the Fleece hosts many music events throughout the year including Rural Arts performances and an open acoustic night every Thursday. It has to be said the Fleece Inn is one of the few places that you can call in on and always be welcomed by a smiling face and genuine Real Ale, whilst it is not unusual to come across Morris Dancers, War re-enactments and spur-of-the-moment folk sessions. This quintessential English pub is run with a love of tradition and offers an experience never to be forgotten. Our Medieval thatched barn lends itself perfectly to Wedding ceremonies, receptions and parties. Our apple orchard and courtyard area allows us to host many events during the warmer months from Apple and Ale to Asparagus festivals. 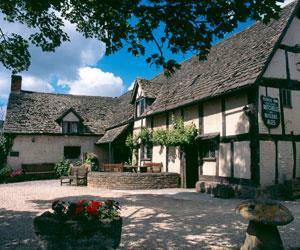 The Fleece Inn is a hot spot for Classic Car meets, Morris Dancing festivals and Cyclist groups. The Quintessential English Pub, owned by the National Trust and run with a love of tradition. M42 J3 - head towards Evesham on the A435. At the Evesham roundabout with the Somerfield Petrol Station on your left, take the first exit onto the A46 towards Cheltenham. At the next roundabout take the first exit - B4035 signposted to Badesy. This road then leads into the village of Bretforton. Once in Bretforton, take the right-hand fork signposted 'The Fleece Inn'. Follow the road into the village, with the church on your right, the Fleece is in the centre of the village.